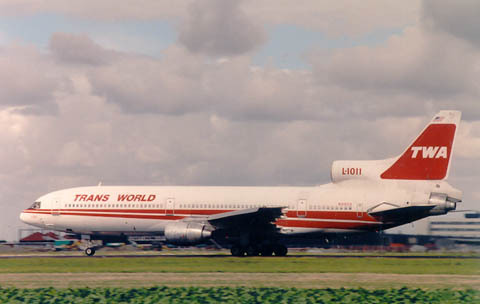 Lockheed L.1011-385-1 TriStar 50 (converted TriStar 1) N31023 (c/n 193B-1080) seen at Amsterdam in the early 1990s. Although I started taking photos from airliners late in the 1990s, after a few hesitant tries earlier on, I have never seen a colour scheme other than this one and the new one. And I have been working in civil aviation since 1979. Email me if you know when this colourscheme was introduced, early 1970s ?! MD-82 N921TW (c/n 49101/1051) in the new colourscheme at Miami,FL in 1999. 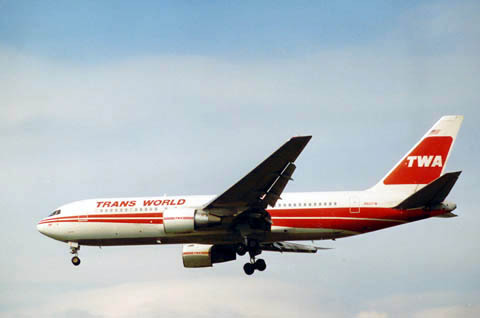 In 1995 this new colour scheme was introduced, but the fleet was not fully redecorated when American Airlines stepped in to take over in 2001.